I am using the LandscapeGrassType with three simple grass meshes on UE 4.8.2. 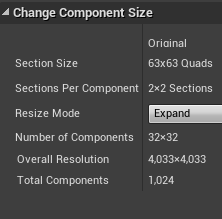 I have placed them on a 63x63 landscape, with each of the three meshes having a density of 18000, which is dense enough to actually look natural like grass. The problem is that when my game starts, every time the grass takes a minute to appear. I have timed this and it literally takes between 50 to 80 seconds depending upon what else the PC is doing. The game still runs whilst the grass is not apparent upon the terrain, at full 60 frames per second. Firstly is there a way to speed this up? Using normal foliage placement to place the grass takes far too much memory and rendering time to complete with this amount of grass foliage, so LandscapeGrassType is performant, it just needs to work faster initially. I can decrease the number of instances of the mesh, say to 5000 which yields a faster more reasonable result but the terrain looks too patchy then and not natural. Secondly, if i can't make it work faster, is there a way i can delay the start of the game until the grass is rendered closest to the player? I too am having this issue. 4.20.3. It takes up to 5 minutes to show on some very large maps. It builds from one side to the other in order. This is somewhat of a severe issue for us, because we will paint the foliage if needed, it just takes a long time. That's pretty strange, we haven't seen that behavior before. Our sample content such as the Kite Demo place grass immediately on level start with a very large number of instances across multiple grass types. What is your Landscape component size? If it's really really small I could see this taking some time because the placement is done on a per-component basis, but not 50-80 seconds. Are you able to send us a project which demonstrates the issue? Thanks for the response jack! Depending on what tile the grass starts streaming from it can take anywhere between 5 and 60 seconds for it to reach me. I'm having the same problem. The foliage is built into my landscape material. On startup it takes about a minute to fully appear. It starts from the left hand side of the landscape and gradually starts to fill in from left to right. It's quite a small landscape. As this is still going on I have unmarked the question as answered. How to setup material that catches wind directional source? DFAO causing blotches on surfaces - related to glass material? Can I control mipmapping distance via material editor? Why won't a specific section of landscape render with applied material?